The Anthurium scandens is a beautiful, climbing houseplant, that will stay small and has glossy-green leaves. This easy-care Araflora plant also thrives in terrariums. The Anthurium scandens is native to the tropical forests of Costa Rica and to its surrounding tropical areas. This epiphytic, climbing plant will thrive as a houseplant but also as a plant in a terrarium. The leaves of the Anthurium scandens are glossy-green and grow from a thin, brown, climbing stem. The flowers are cigar-shaped and pale green. After its flowering small, white berries develop on the flower. This epiphytic, tropical plant flourishes in full light or half shadow, but cannot bear direct sunlight. The Anthurium scandens prefers a moist soil, so take care that the soil is always wet. A soil-substrate that will retain moisture is therefore ideal. If you want to keep this plant in a terrarium, place it in a moist terrarium. The plant makes only few demands on the ambient temperature: 10°- 30°Celsius [50°- 86°] will be fine. 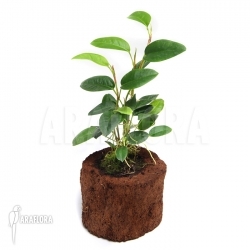 Araflora sells many standing- and hanging containers, which go really well with the Anthurium scandens.